External Affairs Minister Sushma Swaraj said on Sunday that both New Delhi and Beijing have agreed to work together on the issues like terrorism, climate change, sustainable development and global healthcare. 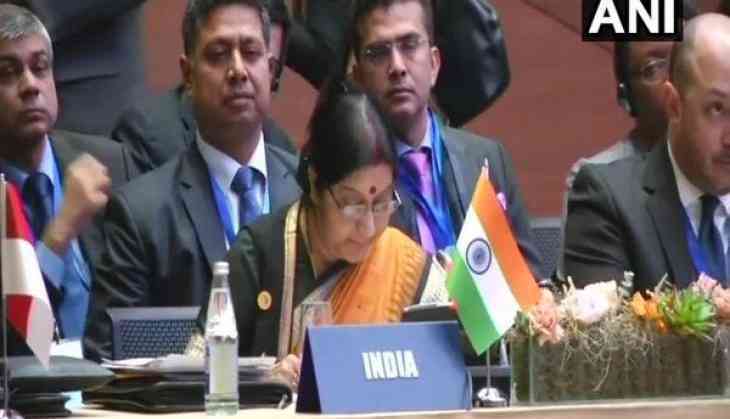 After holding bilateral talks with her Chinese counterpart Wang Yi on the sidelines of SCO foreign ministers' meet, Swaraj, while addressing a joint press conference here, said, "We (India-China) agreed to work together on issues like terrorism, climate change, sustainable development, global healthcare etc." Swaraj further said China has also agreed to share data on Sutlej and Brahmaputra rivers in 2018. "China has confirmed data sharing on Sutlej and Brahmaputra rivers in 2018. As it directly affects lives of people living there we welcome this," she said. The foreign minister also announced that Kailash Mansarovar Yatra will resume this year through Nathu La. Earlier in the conference, minister Wang Yi said Prime Minister Narendra Modi will hold a meeting with Chinese President Xi Jinping in Wuhan city on April 27-28, ahead of Shanghai Cooperation Organisation (SCO) summit in June. Swaraj, who is on a two-nation visit to China and Mongolia, is in Beijing for a ministerial-level meeting of the SCO, where India became a full member in 2017.